Harvard-Smithsonian Centre for Astrophysics Roberto Alfano Publicat. We abridged the videos above by original imagery, with kind permission endorsed by dr. Gareth V. Williams, astronomer at the Solar, Stellar and Planetary Sciences Division of the Harvard-Smithsonian Centre for Astrophysics, and Associate Director of the Minor Planet Center, at Cambridge, Massachusetts. Recommended an Internet bandwidth wide enough to stream the video in its native 1420×730 pixels High Definition (best vision in full screen). Definition high enough to sight the tens of thousands of minor bodies, Comets and Asteroids, orbiting the inner and middle areas of the Solar System, drawn as seen from the North Ecliptic Pole with the vernal equinox off to the right. At right side the enlarged detail of the inner Solar System. The Sun represented as a yellow-coloured starlike symbol and blue-coloured the Earth. A cloud of objects orbits the Solar System barycentre, between the orbits of Mars and Jupiter. Listed below 4 peer-reviewed academic publications, contributed by Roberto Alfano. Juvenile experimental and computational studies of some celestial objects. Three of them are integrated in the Minor Planet Circulars (MPC) since 1947 published by the Harvard-Smithsonian Center for Astrophysics, at Cambridge, Massachusetts, USA. The Minor Planet Center is the global official scientific and professional body dealing with astrometric observations and orbits of comets and asteroids. It operates under the auspices of the division F of the International Astronomical Union (IAU), The IAU is the largest body of professional astronomers in the world. It is equivalent to other bodies like the IUPAC, International Union of Pure and Applied Chemistry and similar existing for the Physical Sciences. The Circulars contain astrometric observations, orbits and ephemerides of both asteroids and comets. Also, new numberings and namings of minor planets, as well as numberings of periodic comets, are announced in the Circulars. Astronomical topocentric positions (α, δ, t) of the newly discovered comet Levy 1990 K01, obtained at the Genoa Astronomical Observatory. Data reduction of the reference stars by mean of Runge-Kutta method. Activities following the program outlined by Brian G. Marsden, Minor Planet Center, Harvard-Smithsonian Astrophysical Observatory, Cambridge, Mass. Data integrated in the orbital parameters on pages 16935-16936. Astronomical topocentric positions (α, δ, t) of the newly discovered comet P/Brorsen-Metcalf 23P, obtained at the Genoa Astronomical Observatory. Data reduction of the reference stars by mean of Runge-Kutta method. Activities following the program outlined by Brian G. Marsden, Minor Planet Center, Harvard-Smithsonian Astrophysical Observatory, Cambridge, Mass. Data integrated in the orbital parameters on pages 15130-15133-15134. Astronomical topocentric positions (α, δ, t) of the newly discovered comet P/Austin 1989C1, obtained at the Genoa Astronomical Observatory. Data reduction of the reference stars by mean of Runge-Kutta method. Activities following the program outlined by Brian G. Marsden, Minor Planet Center, Harvard-Smithsonian Astrophysical Observatory, Cambridge, Mass. Data integrated in the orbital parameters on pages 16473-16636. Time coordinate obtained by atomic clocks. The Method of the Standard Coordinates has been used to provide astrometric topocentric positions for three newly discovered comets to the Minor Planet Center, whose residuals resulted < 1.2” (arcseconds). The Author conducted the research when Director of the Genoa Astronomical Observatory using its optic equipments and facilities. Observatory for which obtained the code 974 by the Minor Planet Center of the International Astronomical Union, division F. Cometary positions were then integrated by the Minor Planet Center (prof. Brian G. Marsden, visible in the video at right side, and astronomers Gareth V. Williams and Conrad M. Bardwell) into the respective sets of orbital parameters. Then, published in the peer-reviewed Harvard-Smithsonian Center for Astrophysics’ Minor Planet Circulars (M.P.C.s) of the International Astronomical Union, since 1947 published under the ISSN 0736-6884.
and awarded in the scientific contest held in Rozzano (Milan area, Italy) on May 1988. The orbital elements of newly discovered comets and asteroids, collectively named Minor Bodies of the Solar System are always poorly defined, reason why they are prone to be lost. Massive amounts of high quality positions, obtained by worldwide Astronomical Observatories equipped for astronomical positional research are then urgently needed by the scientists. The International Astronomical Union’s Division F, Minor Planet Center based at the Harvard-Smithsonian Center for Astrophysics, at Cambridge, Massachusetts, USA. This is the official body caring these aspects of Positional Astronomy on behalf of the global scientific research astronomical community (International Astronomical Union, IAU). Also, some asteroid and comet discoveries of previous decades can be lost because not enough observational data had been obtained at the time to determine a reliable enough orbit. Reliable enough to allow to know where to look for re-observation at future dates. Sometimes, a newly discovered object turns out to be a rediscovery of a previously lost object, which can be determined by calculating its orbit backwards into the past and matching calculated positions with the previously recorded positions of the lost object. In the case of comets this is especially complex because of nongravitational forces that can affect their orbits. The interest is not only scientific. There are today several well funded initiatives devoted to the near future commercial exploitation of the impressive resources of minor bodies. These are mainly mountain-like masses of high valued expensive metals like Platinum, Gold or Iridium. The less lucky encounters being mountain-like masses of nearly pure Iron or Manganese. I am indebted with prof. Donald K. Yeomans, for the assistance he granted to the astrometric researches here shown, providing Jet Propulsion Laboratory/NASA's original texts, otherwise impossible to encounter. Donald K. Yeomans is today the manager of NASA’s Near-Earth Object Program Office at the Jet Propulsion Laboratory in Pasadena, California, USA. The Near-Earth Objects Program Office at JPL, along with the Minor Planet Center of the Harvard-Smithsonian Center for Astrophysics, at Cambridge, Mass., USA, helps coordinate the search for, and tracking of, asteroids and comets passing into Earth’s neighborhood, to identify possible hazards to Earth. Nearly whoever remember the fearful astonishing footage arrived from Celiabinsk (Russia) last February 15, 2013. An asteroid with extremely limited diameter, exploded around 20 km of altitude, leaving a destruction of windows which wounded ~1200 people. The gravity of the effects left many in that military-industry oriented town imagine in the initial minutes it’d be an attack with a nuclear bomb detonated at high altitude, shortly before the followings at ground level. An asteroid big enough to destroy a city strikes the Earth every 100 years. The strategy of the entire Humanity for preventing disasters pass mainly thru the activity of Donald K. Yeomans, today the manager of NASA’s Near-Earth Object Program Office at the Jet Propulsion Laboratory at Pasadena, California, USA. The Near-Earth Objects Program Office at JPL, along with the Minor Planet Center of the Harvard-Smithsonian Center for Astrophysics, at Cambridge, Mass., USA, helps coordinate the search for, and tracking of, asteroids and comets passing into Earth’s neighborhood, to identify possible hazards to Earth. There is evidence of 26 explosions in the upper atmosphere between the year 2000 and 2013, ranging in energy from 1 to 600 kilotons. Donald K. Yeomans visible in the video at right side, is the same Astronomer who personally kindly provided to the Author of these notes, Roberto Alfano, academic texts published by NASA documenting astrometric methods and the data reduction techniques. T time. Position of the body in its orbit at the time of perihelion passage, used as a reference time to define the position of the body at other times. Finally, they can be obtained similar relations for the first and second derivatives of m and n. As known by analytic geometry, to define the equation of a conic section are necessary (at least) three of its points. 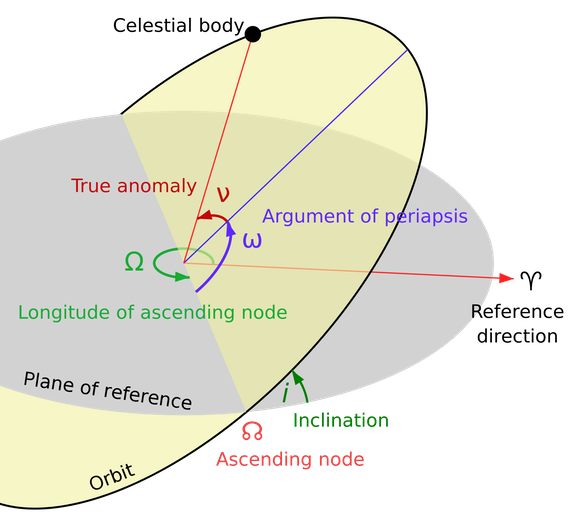 Transposing geometry to the dynamical celestial arena, the elements obtained from (at least) three sets of observations, define the initial orbit of the object. To ameliorate the precision of the orbit integrated by the points (observations), more and more observations are necessary. As a matter of fact, equations can be set up for the difference between the predicted (C, as Calculated) and the observed (O, as Observed) positions. These can then be solved to get the corrections for the preliminary orbital elements, leading to a more accurate set of orbital parameters. Such an orbit is called a definitive orbit. The orbit calculated on the base of the six elements gives the position in the space of the body (asteroid, comet, satellite or planet). The spatial position of the Earth, referred to Solar System's centre of mass, a point closely lying but not coincident with the Sun's centre of mass, does matter if we want to determine the body's celestial position. The geometrical position of the Earth can be obtained from the ephemeris, tables used to find the position of the comet in the plane of the sky. In the special case of comets, the orbit gets perturbed due to the other masses as comets enter the Solar System, and mainly by the most massive planets, Jupiter and Saturn. When the comet is very distant by the Solar System's centre of mass, also the orbital perturbation caused by the other stars, has to be considered.